Still faster, still higher: those two imperatives summed up the develop­ment requests received from military authorities such as the WS and the PVO. They also summed up the specifications of the SM-50 and SM-51, two prototypes of a high-speed interceptor with a lofty service ceiling. The SM-50 was powered by two AM-9BMs whose reheated thrust was 3,135 daN (3,200 kg st) and by the U-19 booster container with two power ratings: 1,275 daN (1,300 kg st) and 2,940 daN (3,000 kg st). The rocket engine could not be relit in flight. The SM-51 was powered by two Sorokin R3M-26 experimental turbojets derived from the AM-9BM with 3,725 daN (3,800 kg st) of thrust and by the U-19D booster contain­er. Its rocket engine had the same thrust as that of the U-19 but could be turned off and relit four times in flight. 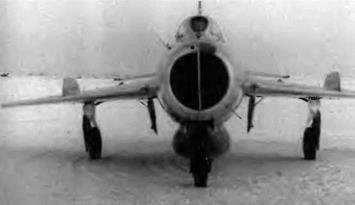 The SM-50 was developed from the MiG-19S, while the SM-51 was developed from the MiG-19P. 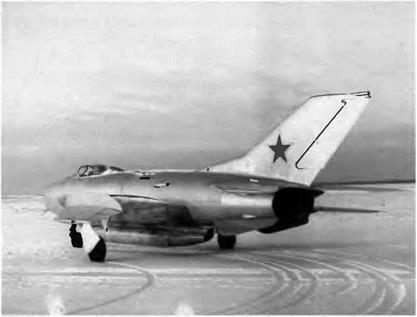 The single ventral fin of the MiG-19S had to be replaced by two well-spaced fins on the SM-50 because of the rocket engine exhaust. The rocket engine weighed 338 kg (745 pounds); the fuel, 372 kg (820 pounds); the oxidizer, 112 kg (247 pounds); and the hydrogen per­oxide, 74.2 kg (163.5 pounds). The U-19 and U-19D booster containers operated almost autonomously; their only links to the cockpit were the electrical ignition control and the dump valve control. Both the SM-50 and SM-51 were armed with two NR-30 cannons located in the wing roots. The SM-51 was equipped with an RP-5 Izum – rud radar. The takeoff weight of both aircraft—including the booster container—was 9,000 kg (19,835 pounds). All factory test flights of the SM-50 and SM-51 were made by V. A. Nefyedov under the supervision of Yu. N. Korolyev, chief engineer. The rocket engine contour gave the SM-50 a very strange silhouette. Their maximum speed was 1,800 km/h (972 kt), their dynamic ceiling was 24,000 m (78,700 feet), and they could climb to 20,000 m (65,600 feet) in eight minutes. Their range—not an important factor for this type of aircraft—was limited to 800 km (497 miles). The state trials of the SM-50 were carried out by two LII pilots, M. M. Kotelnikov and A. A. Shcherbakov. Five SM-50s were built in factory no. 21. The SM-52 was identical to the SM-51 with the exception of its radar, which was the Almaz (“diamond") model.